In conjunction with National Public Lands Day, the U.S. Army Corps of Engineers is looking for volunteers to participate in a cleanup at J. Strom Thurmond Dam at Clarks Hill Lake on Saturday, September 29. The event also is affiliated with Project Aware, a nonprofit conservation organization dedicated to cleaning up ocean environments. Volunteer scuba divers and kayakers, who help transport trash to shore, will conduct debris cleanup of the river side of the dam. Landlubber volunteers can help clean up along the shore. Land projects will include debris cleanup, brush clearing and trail and park maintenance along the shoreline, islands, recreation areas, coves, old road ends and bridge areas. Land volunteers should wear closed-toed shoes and long pants and bring plenty of water. The cleanup will begin at 8 a.m., and a barbecue lunch for volunteers will follow at noon. Check-in for the event will be at the Below Dam South Carolina Recreation Area, 384 Power Plant Road, Clarks Hill, South Carolina. Volunteers should plan to arrive a few minutes early for check-in and a safety briefing. They will receive a free T-shirt (while the supply lasts). Volunteers can register as individuals or groups, and they are asked to sign up by Wednesday, September 12. The divers will attempt to dive below the dam if the power generation schedule allows. Alternate sites will be East Dam and West Dam. 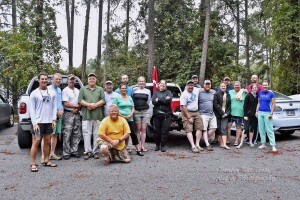 Martinez resident Justin Walter, who is a member of the dive teams for Columbia and Richmond counties, first organized a group of divers to volunteer for the cleanup five years ago. Last year was the first year that Bubbles or Not volunteers participated in the cleanup. 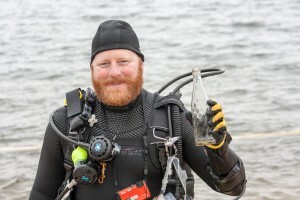 “We had about 30 divers and support staff with Bubbles or Not for the dive cleanup, and we hope to have at least that many this year, too,” says McNaylor. 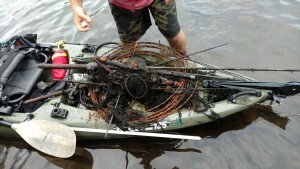 Divers found items including TVs; fishing lines, lures and poles; auto and boat batteries; boat motors; mattresses; bottles and cans. Bubbles or Not, which partners with the Professional Association of Diving Instructors, will offer two classes in conjunction with the cleanup as well. A three-hour class to teach non-divers about ocean conservation will begin at 5 p.m. at the store on Friday, September 28. The shop also will offer a Dive Against Debris class, which includes PADI certification, during the cleanup. This class will include a brief overview before the cleanup and the dive itself. Bubbles or Not also will sell mesh, reusable cleanup bags for $10 for the event. “Every penny goes directly to Project Aware,” McNaylor says. The bags are included in the Dive Against Debris class fee. For more information or to get a volunteer registration form, call Bubbles or Not at (706) 901-5045 or Ranger Ben Werner at (864) 333-1131. Forms also are available online at balancingthebasin.armylive.dodlive.mil. Completed forms can be dropped off or mailed to the Thurmond Project Office, 510 Clarks Hill Highway, Clarks Hill, SC 29821. They also may be faxed to (864) 333-1150 or emailed to CESAS-OP-T@usace.army.mil. In the event of severe weather conditions, National Public Lands Day events will be cancelled. No rain date is scheduled. National Public Lands Day is a nationwide day of service for volunteering at local, state and federal park lands. The cleanup also is part of Georgia’s statewide Rivers Alive program. Published on September 3, 2018 in People and tagged front by Kristy Johnson.